Considered the “heart and soul” of the city, South Scottsdale, Arizona is the most historically preserved area of Scottsdale. Homebuyers will love the variety of real estate options available in this community, from historic properties to brand new high-rise condominiums. With a great selection of nearby amenities, schools, and mountainous landscapes, this community is the perfect place to buy a home for families, and young professionals alike. Those interested in buying a home in South Scottsdale will be pleased with the affordable range of homes available. More reasonable that the expensive North Scottsdale region of the city, the prices for homes in South Scottsdale average at $291,500. Just 15 minutes from Downtown Phoenix, this community is also an attractive homebase for anyone interested in finding a home close to their job in the big city. 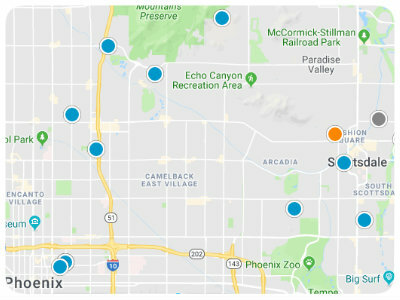 In addition to the convenience and affordability of the area, South Scottsdale also boasts a new research center for Arizona State University, as well as international research and development companies that add revenue to this thriving city. With a wide range of amenities available, local residents have access to almost everything that one would find in a major metropolitan city. An endless array of shopping centers, restaurants, parks, and nearby desert landscapes allow local homeowners to live an exciting, quality lifestyle. For more information about buying a home in South Scottsdale, Arizona, please do not hesitate to contact us today!